Date – 2nd May 2018 at. 11.30 a.m. Location – 3 Northland Place. Dungannon. BT71 6AN. Plaque sponsored by Mid Ulster Council. 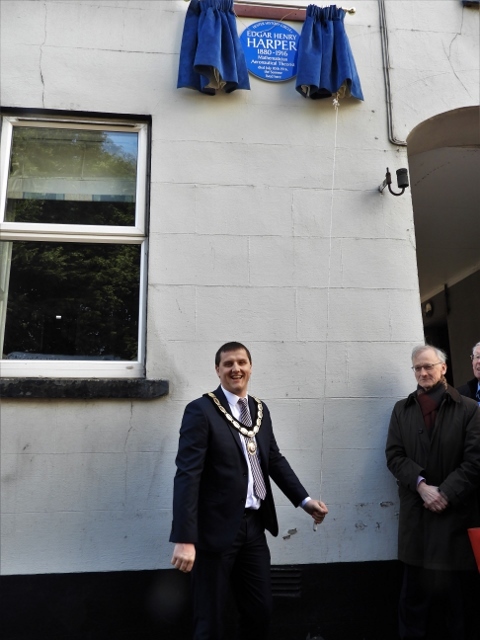 Unveiled by Deputy Chair of Mid Ulster Council, Councillor Mark Glasgow. 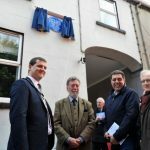 Councillors, local historians and guests gathered at the former home of Edgar Henry Harper for the ceremony of the unveiling of the Blue Plaque, and to listen to Chris Spurr, Chairman of the Ulster History Circle, the Deputy Chair of the Mid Ulster Council, Councillor Mark Glasgow and Aiden Fee, Chairman of the Dungannon History Forum, pay tribute to the man who made a great contribution to the theory determining the stability of aeroplanes. 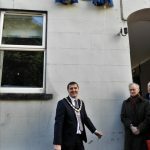 Edgar’s former school, Royal School Dungannon was represented by headmaster, Dr. David Burnett together with two pupils from the School..
After the unveiling at Ranfurly House, further tributes were given by Ernie Cromie of the Ulster Aviation Society and Patricia Bogue (who nominated Edgar Henry Harper for a blue plaque) from Donaghmore Historical Society. 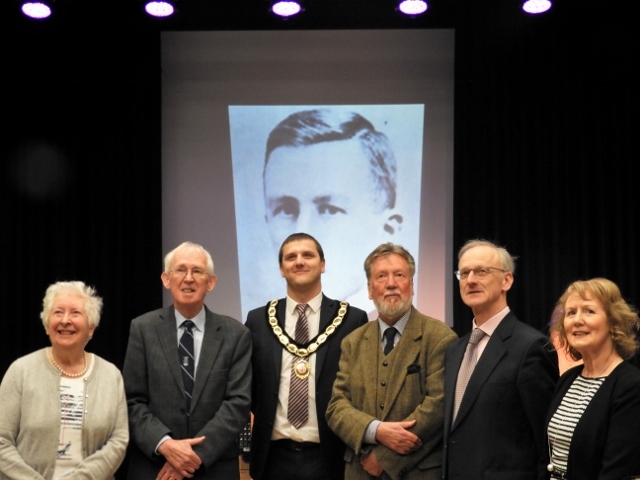 The closing address was given by Frank Shields from the Dungannon History Forum. 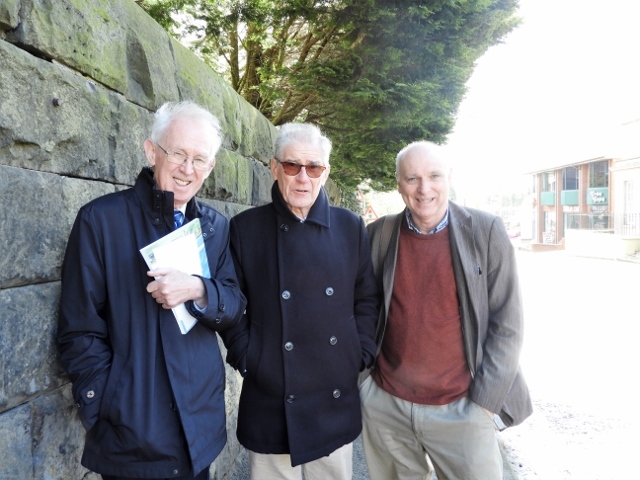 LR – Ernie Cromie, Ulster Aviation Society, Dr. Peter Collins and Paul Clements, Ulster History Circle. 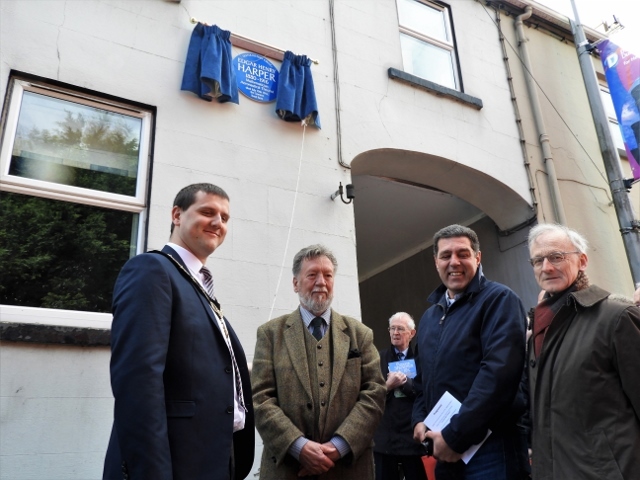 Deputy Chair Mid Ulster Council, Councillor Mark Glasgow, unveils the Blue Plaque. 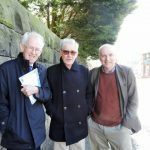 LR – Councillor Mark Glasgow, Chris Spurr, Chairman, Ulster History Circle, Namik Saygi, owner of 3 Northland Place, and Aidan Fee, Chairman Dungannon History Forum. 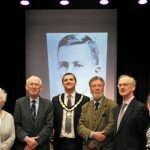 Patricia Bogue, Donaghmore Historical Society, Ernie Cromie, Ulster Aviation Society, Councillor Mark Glasgow, Chris Spurr, UHC, Aidan Fee, Dungannon History Forum and Christine Magowan, Arts & Culture Development Officer, Mid Ulster Council.